The Empty Quarter is one of the largest sand boxes in the world. Every time I think about playing in the sand, I want to go to the Empty Quarter of Saudi Arabia. Big sand and endless dunes are a giant magnet for my Defender 110 Land Rover. I don't mind driving in wadis, and exploring in the mountains has its rewards, but driving in sand feels good all the way to the bone. A week-long expedition to the Empty Quarter is an instant cure for depression. The moment I drive in sand, the bad stuff goes out of my mind, and in comes the good. I don't know why sand makes me feel so good, but it does. It's an undeniable fact of my life. Pristine sand dunes take me back to a biodegradable era where everything is natural. In deep desert, plastic bags blowing in the wind and piles of rubbish do not exist. And best of all, the white noise of civilization is nowhere to be found. The sand dunes of the Empty Quarter are the only place on planet earth where I have experienced total silence. 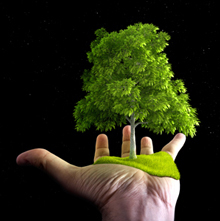 If I hold my breath and do not pollute the environment with the sound of my breathing, I am in total silence. I feel like I am standing on holy ground. 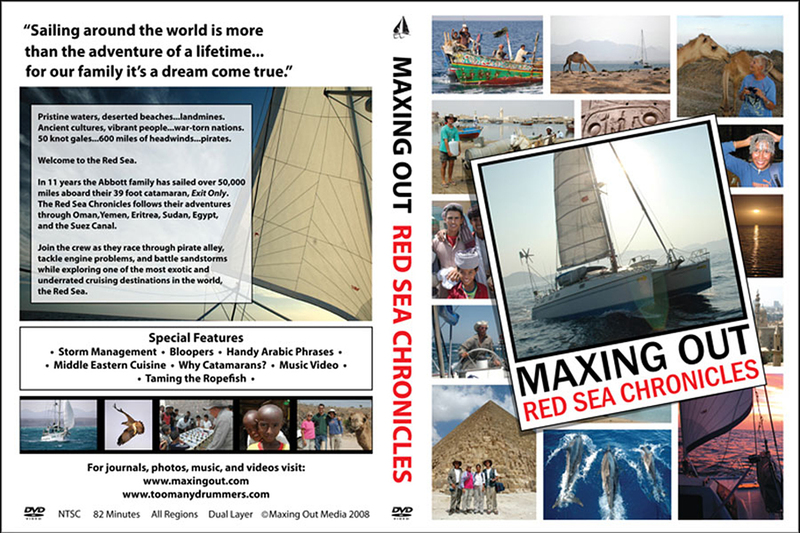 Some of our expeditions into the Empty Quarter last a full nine days, but on this trip we spend only three or four. 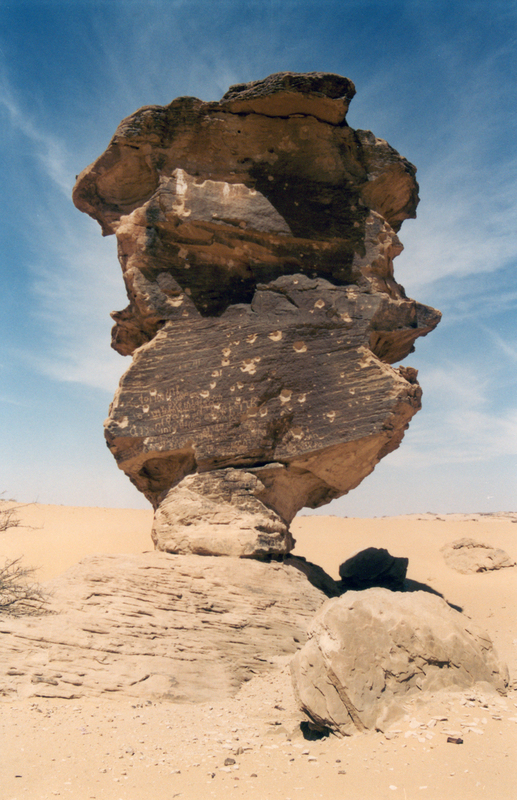 This expedition is special because we plan to visit the petroglyphs of the Rock Wall Journal in southern Arabia after we regain our sanity in the Empty Quarter. Packages of food carry printed labels that list the nutritional value of each ingredient found in a packet of food. The labels state the minimum daily requirement for each ingredient inside the package. Some people consume supplements to insure that they get their minimum daily requirements to maintain robust health. 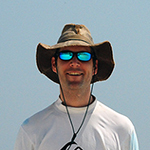 As far as I am concerned, a couple of days in sand is the absolute minimum requirement for any trip into deep desert. If I don't get several days of sand, I feel like I am missing out on my minimum daily requirement for sand. Sand clears the mind and puts things in perspective. It's the best spa on planet earth. A satellite photo from a couple of hundred miles in space focuses on our playground. What's our plan? We will drive and camp in the endless dunes. Where are we going? Wherever we want. How long are we going to stay? For as long as we want. The truth is that we are going to stay for as long as it takes to get our minimum daily requirement of sand. 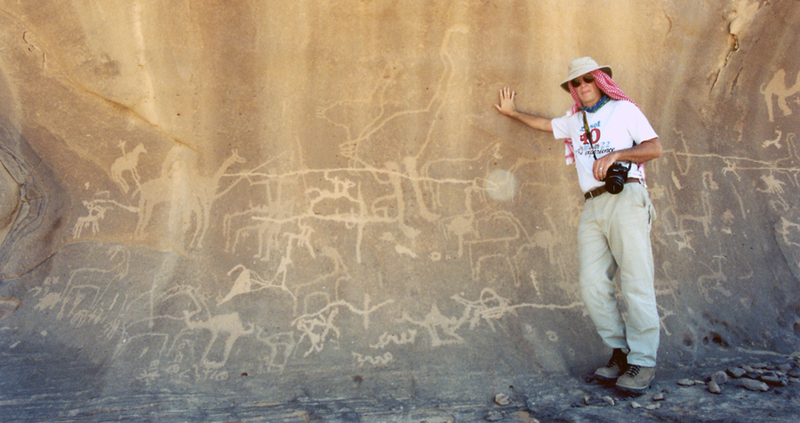 Then we will turn west toward the Tuwayq escarpment, ride a sand ramp down to the desert floor, and travel to the Rock Wall Journal where we can study petroglyphs of southern Arabia. We enter the southern half of the Empty Quarter though a convenient break in the Tuwayq escarpment and head southeast until we arrive in big sand. Rolling mountains of sand give way to broad valleys separating each line of dunes from the next. Rolling sandy vista remind me of the massive ocean swells of the Pacific Ocean. 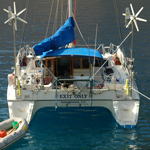 Our catamaran rode those swells for months as we sailed from Panama to New Zealand. The difference between the Empty Quarter sand and the Pacific Ocean is that on the ocean, the swells and waves are moving. In the dunes, the swells and waves of sand are frozen in time. It's as if God told the sand dunes to stop, and then set us free to cruise on his ocean of sand. Our three vehicles tuck in behind a frozen wave of sand to spend the night. Our Defender 110 is anchored in the lee of a twenty foot wave of sand. The tent is up, and after an evening around the campfire, we will sleep soundly in the total silence of the Empty Quarter. Since we will be in deep desert for a short time, we are carrying only four jerry cans of fuel on the roof rack rather than the usual eight. Five more cans of fuel are stored in a box inside the vehicle. Three boxes of firewood are on the back of the roof rack. On trips into the Empty Quarter where there is no fuel available for a campfire, each vehicle is responsible for bringing enough wood for two or three campfires. We will supply fuel for three campfires on this trip. When we have transfused enough sand into our veins, and it's time of leave, we turn west to escape the Empty Quarter. This is not the usual exit from the Empty Quarter, because there is a 500 foot tall escarpment that stands in our way. Sand dunes run up to the Tuwayq escarpment, and sand spills over its edge to the desert floor below. You can't exit the dunes anywhere you want. You have to locate a sand ramp that takes you over the edge of the escarpment and down to the desert floor. We don't know the exact location of a sand ramp that will do the job for us, but the desert knows, and without much prodding gives up its navigational secrets. We simply locate a bedouin track that heads west, and follow it to the escarpment. If it's a big track, there is a good chance it will lead to a place where we can descend the escarpment. It's a chance that we have to take unless we want to drive in the dunes for a couple of hundreds kilometers further to the south where the escarpment finally ends. Not all sand ramps are up to the task of getting us down from the limestone Tuwayq. Only a few of them rise all the way to the top of the escarpment and provide a safe way to descend. As we head further south and west in search for a good track, the valleys between the dunes flatten and reveal the limestone bedrock on which the massive dunes reside. The closer we come to the edge of the escarpment, the wider the valleys become. Close to the edge of the Tuwayq escarpment, the dunes diminish in size and the limestone of the Tuwayq is covered by patches and sheets of sand. Sand spills over the edge of the escarpment creating irregular sand ramps most of which never reach the top of the escarpment. If you are unlucky, you may have to inspect four or five sand ramps before you locate one that lets you descend to the desert below. In the foreground, an agricultural pivot makes the desert bloom. A big green pivot puts a smile on the face of a thousand camels. A Bedouin track leads us to a sand ramp that we hope will take us down from the top of the escarpment. Satellite photos are awesome. The arrow points to the place where we can descend 500 feet to the desert floor below. The satellite photo is spot on. 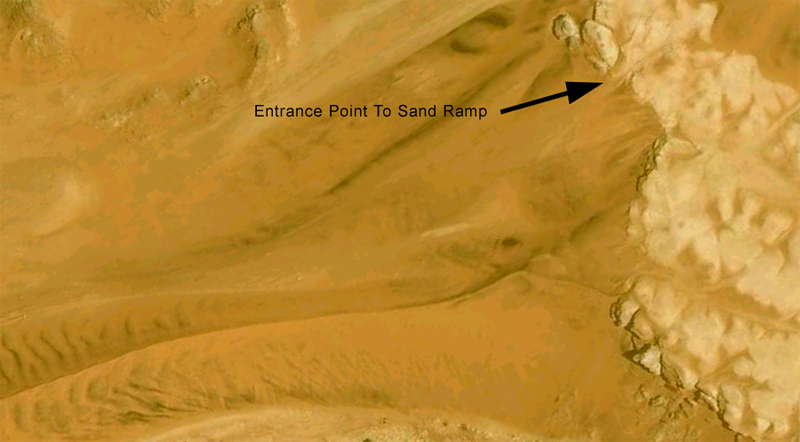 The groove in the escarpment seen on the satellite photo translates into a real world photo of our sand ramp. The large rocks on the right side of the sand ramp show up nicely on the satellite picture. Bedouin tire tracks heading down the sand ramp confirm that it will take us to the bottom of the Tuwayq. Through binoculars we can see tire tracks at the bottom of the sand ramp. The lower half of the ramp has firmly packed gravel and sheet sand. The upper half of the ramp is soft sand. We definitely can drive down the ramp, but there is serious doubt about whether we could ever turn around and drive back up to the top. This could easily be a one way trip. We line up our vehicles at the top of the ramp ready to make our descent. The white limestone of the escarpment is actually a massive reef that extends more than 900 kilometers to the north. 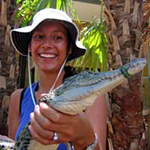 Fossilized sea shells and coral are found in abundance on the top of the escarpment.. The track that we take down the escarpment is straight forward. Put the vehicle in second gear and stay north of the sand dune as you descend. It's a piece of cake. Red Defender sinks in the soft sand near the top, but there is no danger of getting stuck while heading downhill. The sand becomes progressively more firm as you travel down the ramp. Two vehicles far in the distance look like toys parked at the bottom of the ramp. The hood of green Defender points in the direction of our next adventure as we prepare to descend. We are sorry to say good-bye to the Empty Quarter, but we will be back. In fact, we came back sooner than anticipated. We decided that we would test the ramp to see if we could drive back up to the top of the escarpment. Someday we might want to enter the big dunes using this ramp if it is technically possible. Two of our vehicles attempt the ascent. The lower half is easy. The upper half of the ramp is soft sand, and the outcome is in doubt. The white Nissan did not make it all the way to the top. More speed is in order, and now is the time to put the accelerator all the way to the floor. Our V8 Defender 110 does really well ascending dunes as long as the accelerator is all the way to the floor. If you let up on the accelerator for even a second, you will not make it. We hit the lower part of the sand ramp in third gear at full throttle and continued up until our speed began to falter, and then in a nanosecond we dropped into second gear with the accelerator all the way to the floor. I was not sure that we were going to make it, but the Defender never stopped moving until we parked it on the top of the escarpment. I love the guts in a Defender 110. As we drive away from the escarpment, we see how non-descript this ascent appears from a distance. We put the GPS coordinates in our log book for future reference. You never know when you might need to make an emergency ascent up a sand ramp into the Empty Quarter to get your minimum daily requirements of sand. This isn't hotel California, and you can leave any time you want. Before we visit the Rock Wall Journal at Hema, we stop at a restaurant out in the boondocks to get some rice and chicken. Chicken on a rotisserie is the safest food to eat on planet earth. You can be starving in an armpit of the world looking for something to eat, and if you find roti chicken, you have an instant feast. It's impossible to get sick eating roti chicken. Everywhere I travel in remote locations, I look for chicken on a rotisserie. I have never gotten sick from eating it in more than fifty countries. The chicken is so well done that the meat falls off the bone. Every time I eat roti chicken, I instantly get a flash back to my Arabian adventures. A chicken and rice feast is incomplete without Arabic flat bread. Arabic bread fresh out of the oven is always safe, and the taste and smell of freshly baked bread is awesome. With a belly full of chicken and fresh bread, we head south west to an area called Hema. 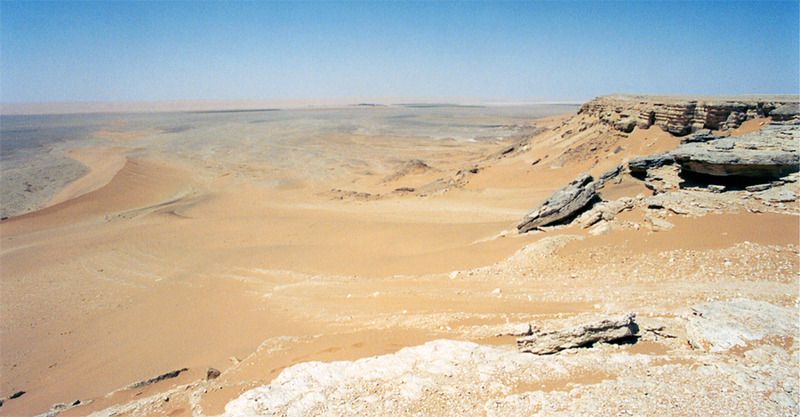 The desert sand gradually gives way rocky outcrops. We choose to camp in a sheltered wadi that offers privacy and protection just in case the wind comes up. Blowing sand is a hassle in a campsite, and it's good to have protection from the elements on three sides. The sandy wadi is dry, and from it's appearance, it's been a long time since a flash flood threatened this campsite. We only camp in wadis if there is no sign of rain in the sky. Flash flooding is a serious threat in the Arabian desert. The rock above our campsite displays the effects of a million years of flash floods eroding the rock before spilling in a waterfall down into our campsite. One of our friends camped in a wadi in western Arabia, and a flash flood carried away his vehicle never to be seen again. The campers lost everything and spent three days hiking back to the highway to be rescued. We were not camping in rainy season, and there was hardly a cloud in the sky, so the risk of flash floods at our campsite was zero. After breaking camp, we explore wadis in search of petroglyphs. There aren't any road signs that tell you where you are or where you can find petroglyphs. We are on a scavenger hunt. This is an expedition for those who like driving around in Land Rovers scanning the countryside for panels of ancient art. Lots of sandstone covered with desert varnish make this prime petroglyph country. 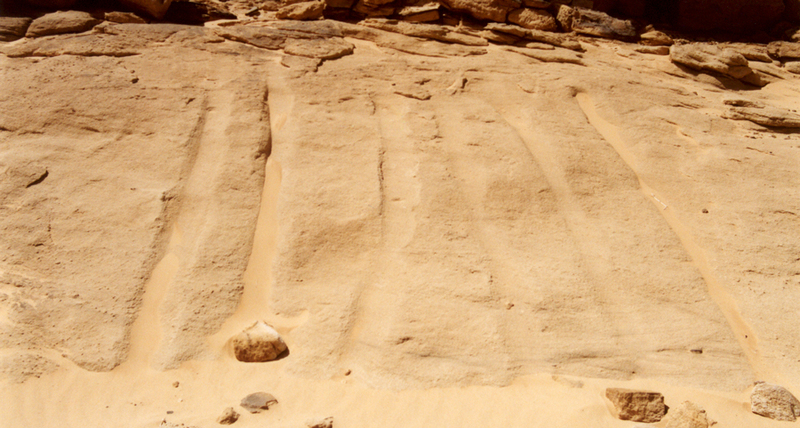 If we follow the winding desert tracks, we will almost certainly discover the Rock Wall Journal - the petroglyphs of Hema. Persistence pays off. I call petroglyphs the Rock Wall Journal. 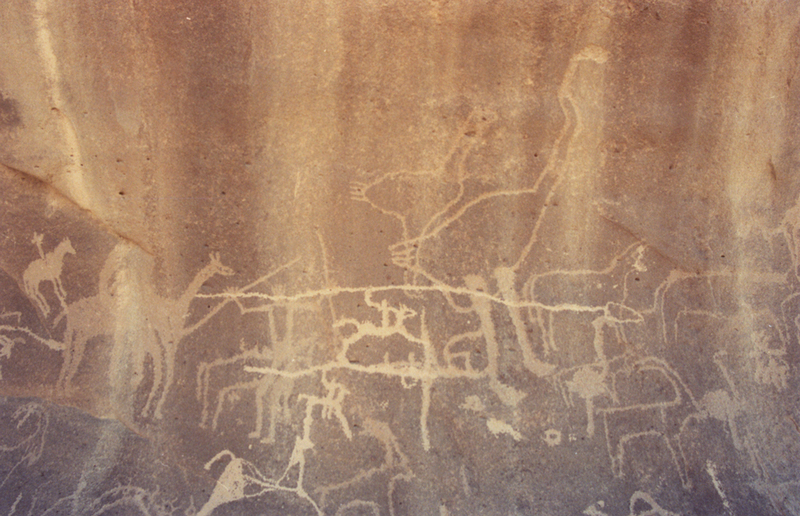 Petroglyphs are a window on the past that tells the story of ancient people and of things they hold dear. They are a communal journal embedded in rock just as securely as the ten commandments were written on tablets of stone at Mount Sinai. The Rock Wall Journal tells tales of valor and values, and victories and defeats. They are web pages from the past frozen in time with a timeless message that reveals how much we are like them. The ancient people who created the Rock Wall Journal were not simple-minded cavemen waiting to evolve into real human beings. These highly intelligent people had an appreciation for the natural world in which they were immersed. They displayed their focus on the natural world with stylized drawings that are still pleasing to modern eyes. Although they had a limited palate and only a few tools with which to work, they created unforgettable panels of rock art. Dull-minded people struggling to survive don't sit around pecking rock art on canyon walls. Bright individuals create rock art to transmit a message to their peers and to future generations. They knew what they were doing when they took a tool in hand and made their mark. They were pecking an article for the Rock Wall Journal, and for the next thousand years, everyone who came that way would see their work. They created something that will endure longer than the non-biodegradable technological trash of the twenty-first century. Those who wrote in the Rock Wall Journal made their mark, and that mark endures. They did something significant. The Rock Wall Journal reveals that the ancients loved their animals, and they demonstrated a strong attachment to the natural world. They also had an eternal problem with war. They respected power and appreciated the beauty found in nature. They displayed a well-developed sense of fashion adorning themselves with necklaces, and even displayed special hairdos in their rock art. It's not surprising that ostriches show up on Rock Wall Journal because the ostrich was abundant on the Arabian Peninsula. Ostrich eggs are an excellent food source, and it's likely they were an ancient delicacy. Ostrich meat must have graced many a table during times of plenty. The ostrich egg shell makes an excellent canteen in which to carry water when traveling away from camp. Even if you drop the egg, and the shell shatters into a thousand pieces, all is not lost. Ostrich shell fragments create awesome beads to hang around your neck. As you travel in the desert, you often discover hundreds of pieces of ostrich shell lying in the sand. When you cruise across the desert sands in your Land Rover, if you see a white glistening reflection in the sand, chances are that you are looking at the broken fragments of an ancient ostrich shell. The Ostrich was hunted to near extinction with the advent of rifles on the Arabian peninsula. Now the ostrich are a protected species and are being slowly reintroduced into the desert from reserves in Saudi Arabia. 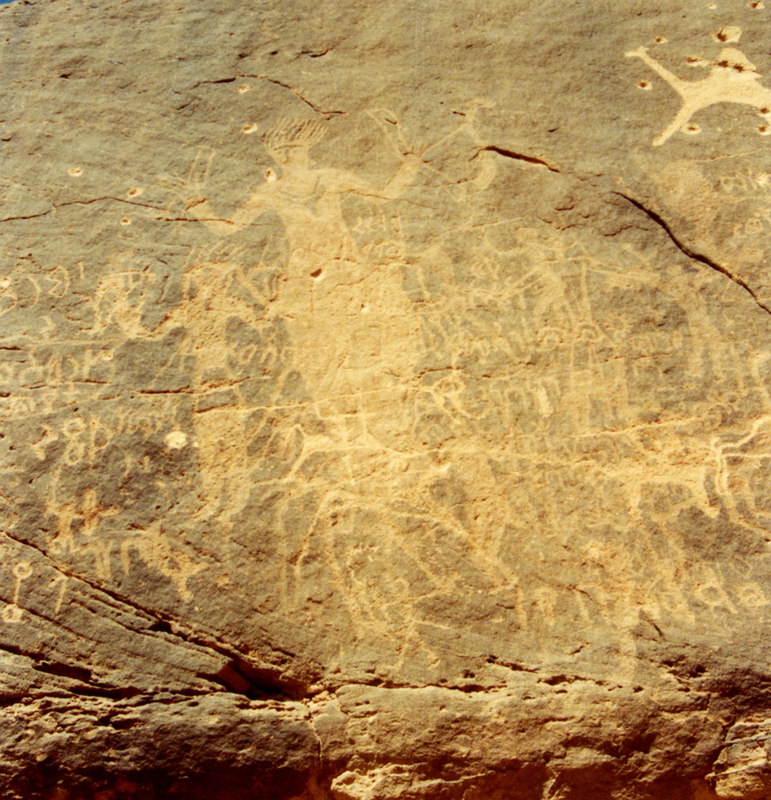 Antelopes are popular figures on many panels of rock art. 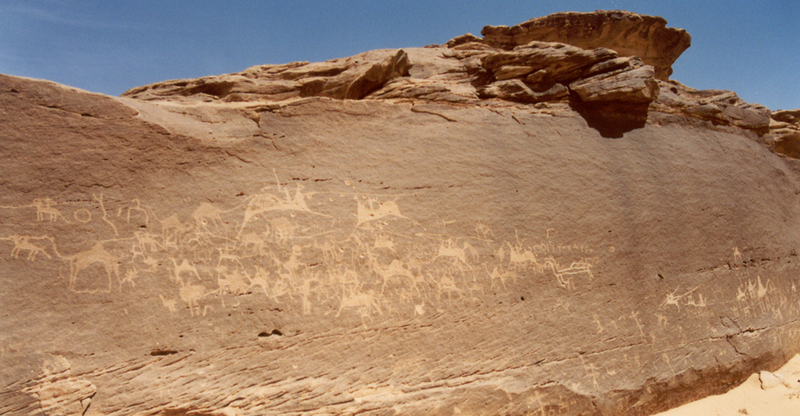 This half pipe of rock art displays an abundance of camels, antelopes, and Arabian horses as well as fighting figures. More than a few fighting figures on Arabian horses decorate this panel. Nobody knows whether this panel represents the work of one artist or dozens of artists, and it's not clear whether the panel was created over a thousand years, or over a shorter span of time. 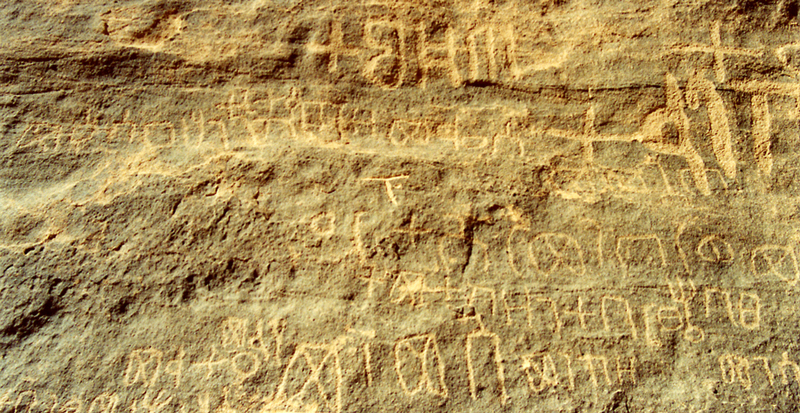 The Arabian peninsula has been inhabited for tens of thousands of years, and before the development of Arabic script, people wrote on the Rock Wall Journal in languages that have long since died out. In some locations, the inscriptions have been deciphered by scholars knowledgeable in ancient scripts. Sometimes the message tells of the conquests of invaders with the names of leaders memorialized forever in stone. Politicians and generals have always wanted to have their exploits and accomplishments carved into stone. Ancient egos are just as big as modern ones. Ferreting out petroglyphs requires an eagle eye. As you drive through the wadis, you scan the flat sandstone walls hoping to discover a petroglyph that stirs your imagination and that connects you with someone who lived five thousand years ago. Binoculars make it easier to pick out rock art at higher elevations. If you spot something interesting, you park your Defender and climb up the rock walls to examine your discovery up close. Sandstone is easy to climb with excellent traction underfoot. It's all feet and eyes as you explore the Rock Wall Journal. This panel has a special treat for those willing to ascend the rock face. An antelope runs for his life with four predators ambushing him on the rock. One has him by the tail, another attacks one of his front legs, and a third and fourth attack from the opposite direction. The predators all look different. Two of them may have feline tails, two have solid colors, and one has stripes on his body. The striped predator could represent a hyena. 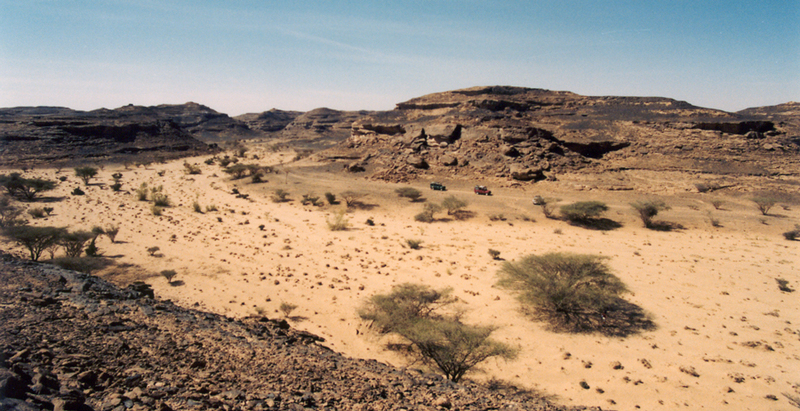 The Arabian Peninsula was connected to Africa in the past, and there are are even rhinoceros bones found in the Empty Quarter. Today, two species of gazelles, as well as oryx live in the Empty Quarter on a national preserve at Bani Maarid. Scenes like this are right out of Africa with predators working as a team to bring down an antelope. It's obvious that the artist lived in a place and time where the struggles between predator and prey were a part of daily life. Some authorities state that the camel was domesticated around 3500 B.C., and horses came to Arabia around 2500 B.C. Although nobody knows for sure when camels and horses were commonplace on the Arabian peninsula, there is no doubt that Bedouins loved their camels and horses. 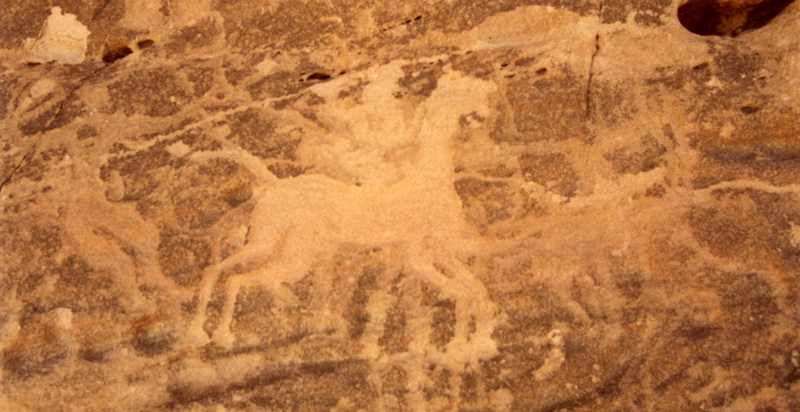 Mounted warriors used Arabian horses on the field of battle. Warriors project their power with swords and spears as they charge across the rock face. A beautiful woman emerges in splendor from a field of chaotic petroglyphs. Her fancy hairdo points skyward, and her thin fingers hold mysterious objects in the air. This is no ordinary lady of the rocks. Around her neck and on the front of her chest is a large necklace or breastplate. 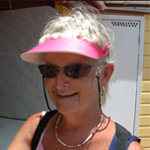 A second woman with similar hairdoo resides beneath her right arm. Although petroglyphs easily endure the ravages of mother nature for a thousand years, they cannot stand up to the assault of men with their high powered weapons. 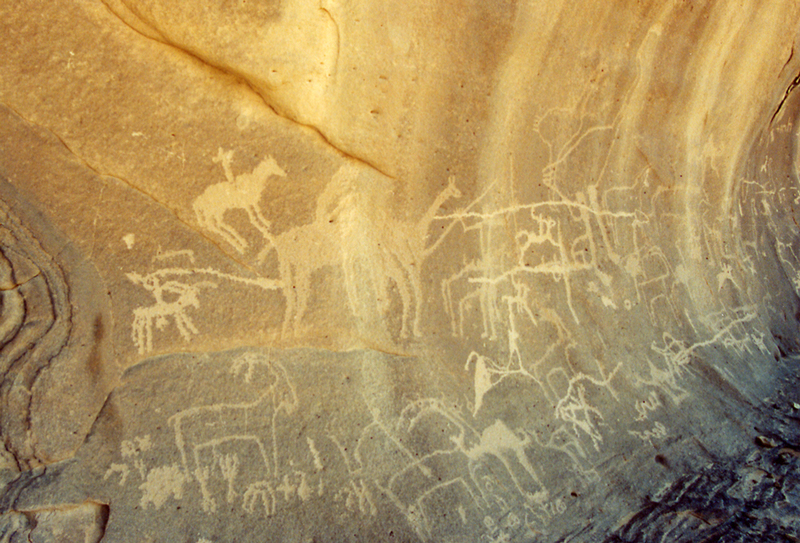 The camel at the top of the petroglyph is the victim of target practice with a high powered rifle. A round of ammo grazes the top of the woman's right shoulder, and there is a direct hit in her lower abdomen and left leg. Four rounds of ammo scar the rock above and beside her right arm. Whenever we meet Bedouins in the desert, we usually find that they are well-armed. Occasionally they have a low powered 22 caliber rifle, but more often, there is a Kalishnakov or AK-47 lying on the floor of their truck. I don't know who used these petroglyphs for target practice, but I know that it was not expatriates, because we are not allowed to own or carry firearms. This warrior sports a long sword at his waist, and there is a suggestion of a shield or large knife in his left hand. The Rock Wall Journal is heavy into texting. When ancient people did texting, it was meant to last for all time. It's a lot of work to text in rock, but if your ego is big enough, and your message important enough, rock texting gets the job done just fine. The person writing this text didn't have much to say. I suspect it was something like, "I would walk a mile for a camel." In ancient times, the main competitor to the Rock Wall Journal was the Rock News Network which was also called RNN. I suspect that the Rock Wall Journal was the bastion of prehistoric conservative opinion, whereas the Rock News Network was the earliest expression of liberal media bias. 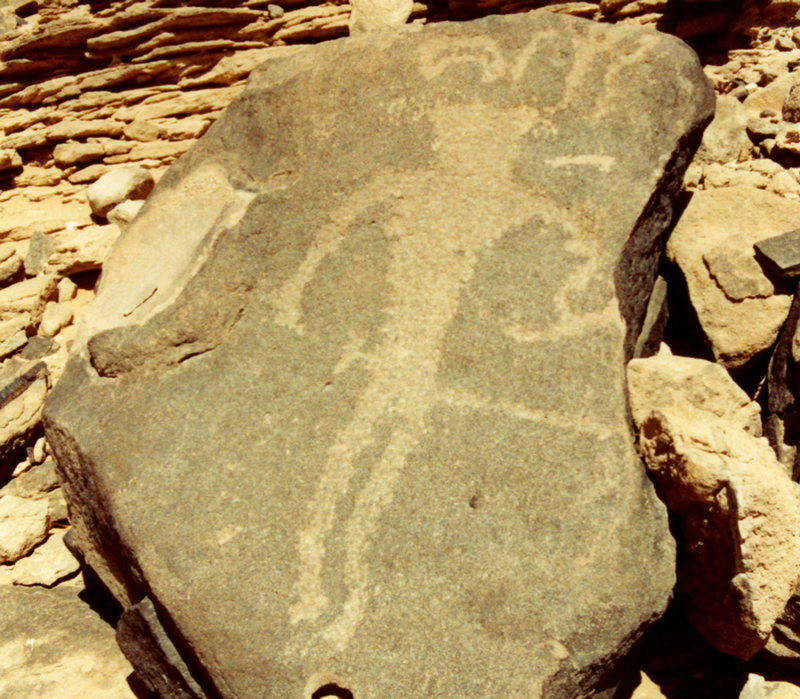 This petroglyph probably told everyone to be afraid and do what they were told, because if the didn't, a Big Guy was going to come and kick their buns all the way to Kuwait. That is my translation, but the translation is probably a little rough around the edges, and there is a chance it could be slightly off. Nevertheless, I don't think petroglyphs like this are poems about tip toeing through the tulips. When a Big Guy commissions a message on a rock, he isn't fooling around, and you better listen. I don't see any place for comments under the message from the Big Guy. 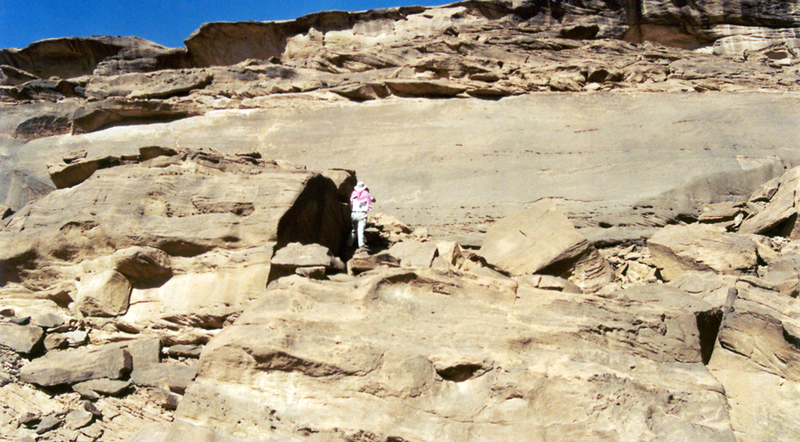 After we leave the wadi, we head out on a sandy plain in search of sandstone faces on which we can discover more petroglyphs. This bullet riddled rock contains messages from the Big Guy. Apparently, present day Bedouins don't care that much about messages from the Big Guy. An AK-47 trumps messages from the Big Guy seven days a week. This panel depicts a chaotic battle between competing warriors on Arabian horses with lots of camels mixed in the fray. The fog of war is thousands of years old. It's hard to tell who is fighting who, and probably more than one warrior dies from friendly fire. The writing on the right side of this panel may describe the name the battle. It might say something like "Operation Desert Storm 2000 B.C." 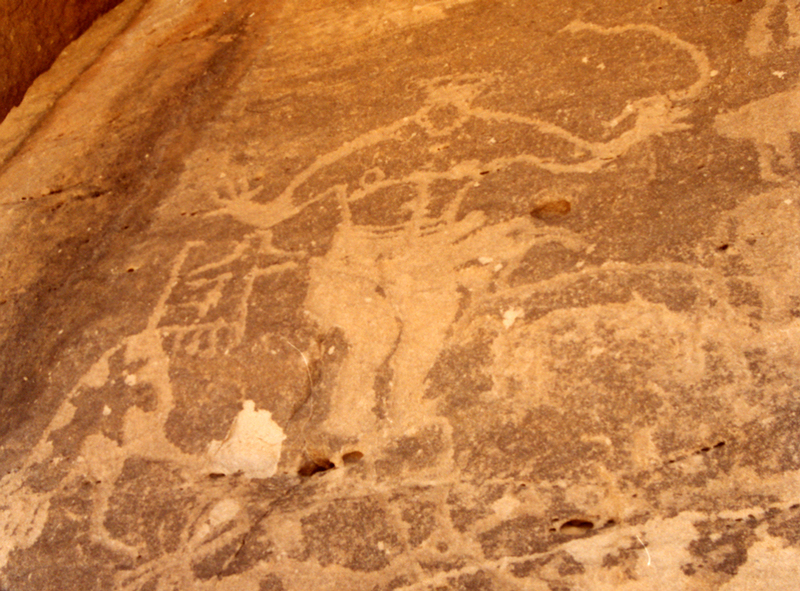 The animal on the lower right portion of the panel appears to have been added at a much later date, because it covers some of the original rock art. Unfriendly fire takes it toll on ancient warriors locked in eternal combat. Opposing warriors are the victims of the AK-47s and Kalishnakovs of the twentieth century as multiple bullet holes riddle their galloping steeds. Psychological warfare is thousands of years old. Why else would they show warriors throwing lances that are twenty feet long sporting giant blades on the business end of their spears. Large swords hang from their waists, and massive horses with tiny heads charge into battle. These Bad Boys of war could give anyone a serious dose of post traumatic stress disorder. 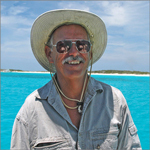 A special surprise awaits as we travel south in search of more petroglyphs. Off in the distance, we spot an isolated rock arch that begs for exploration. 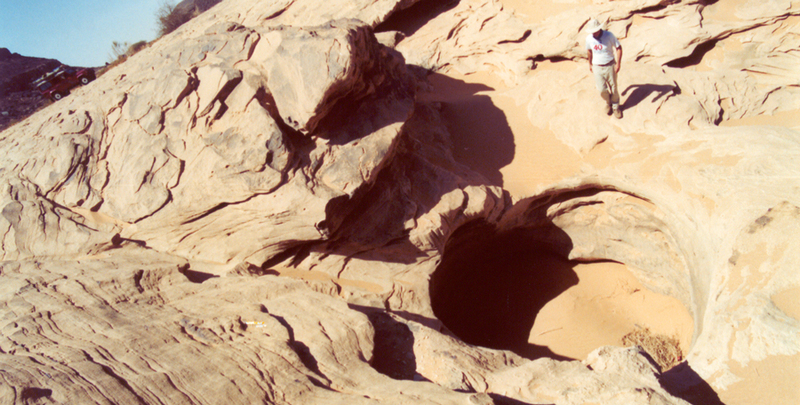 The arch is made of sandstone, and the odds are in our favor that petroglyphs will be found somewhere near the arch. 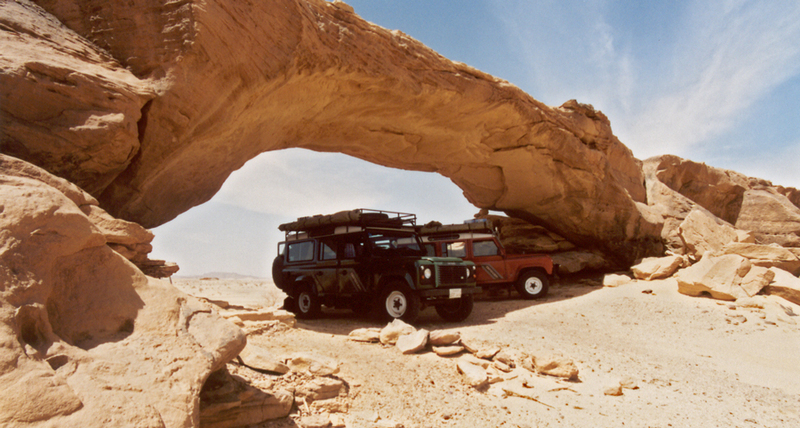 The sandstone arch provides good protection for our Defenders in the noonday sun. 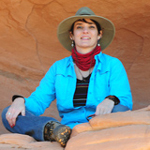 It's a great place to fix lunch and scout the area for petroglyphs. We check out the top of the arch, but there are no petroglyphs in sight. We didn't think there would be any petroglyphs up there, so we aren't disappointed. The good part is that we enjoyed climbing the rocks and walking across the sandstone bridge. On the far side of the bridge we discover a large panel of rock art. There's no doubt about it, the Rock Wall Journal extended it's domain for a long distance into southern Arabia. The artists creating this panel have graduated from stick figures into stunning and complicated representations of animals and humans. The Arabian horse displays its trademark elevated tail. The horse's mouth is open as he neighs in the heat of battle. His large hoofs and thick legs show that this is no ordinary steed. I am sure there was lots of competition among ancient movers and shakers as to who would be featured on the cover of the Rock Wall Journal. The man of the year did not originate with Time Magazine. After searching the Rock Wall Journal for more than a decade, I believe that I have discovered the Original Man of the Year sporting the Six Pack of the Year. This remarkable cover to the Rock Wall Journal reveals the true state of ancient muscle builders before the advent of steroids and other banned substances. Anyone can get a six pack today by injecting anabolic steroids and working out for a grueling fifteen minutes a day. But in ancient times, things were different, and a six pack really meant something. The Six Pack Man of the Year has broad shoulders and huge hands. In his left hand, he has a whip or a snake - it doesn't matter which - because both of them are manly things right up there with stuff like our present day lifted trucks and automatic weapons with extra large ammo magazines. The Six Pack Man of the Year sports headgear appropriate for such an important person, and his thick legs are pure muscle. He is a man's man for sure. The ostrich standing next to the Man of the Year is no slouch either. It sports fancy tail feathers and sculpted body with a small head which it is not hiding in the sand. I wonder how much the artist got for this front cover on the Rock Wall Journal. Just to the left of the sandstone arch are prehistoric groves cut into rock. Each groove is four to six inches wide and more than six feet long. The purpose of the grooves remains a mystery. The how of making groves like this is easy. Simply take large smooth rocks in the palm of your hand and run them up and down the inclined sandstone face to create the parallel grooves. The grooves could be ceremonial or associated with food preparation. The proximity of these grooves to the rock arch makes me believe that the grooves had a ceremonial significance that we will never know. Our days spent reading the Rock Wall Journal have been enlightening as we travel though this mysterious land. Voices from the past project a modern message. The Rock Wall Journal leaves us with three points worthy of consideration. 1. War is as old as humankind, and don't expect it to go away anytime soon. The only difference between ancient and modern warfare is the weapons. 2. Image is everything when you are on the cover of the Rock Wall Journal, and it's possible to have a real six pack without anabolic steroids. 3. Big Guys like to post scary messages on rock walls that keep the fearful masses in line. Be afraid, be very afraid! And that's the way it is 2011 B.C. and 2011 A.D.